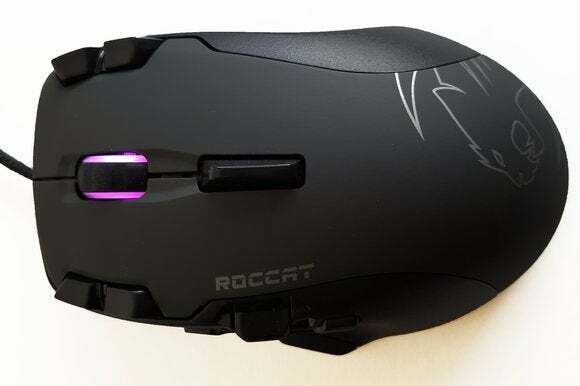 The Roccat Tyon feels like a relic from another age—one where mouse manufacturers frantically tried to cover every surface with buttons in some sort of mad arms race (or fingers race, if you will). Why settle for one button for your index finger when you can have three buttons? And three for the ring finger. While we’re at it, why not build the thumb its own telegraph switchboard? The main draw of the Roccat Tyon is the buttons. Sure, it has an 8,200 DPI laser sensor, the standard 1,000 Hz polling rate, and a nifty RGB light channel around the bottom of the mouse. The Tyon has (to my count) twelve buttons and an analog paddle that wobbles up and down. What’s more, one of those buttons functions as a modifier key (which Roccat brands “Easy-Shift Technology”), effectively giving you double the button mapping. There’s Left, Right, and Middle click, plus two additional buttons mapped to both the ring and index fingers. Behind the scroll wheel is a paddle that clicks back and forth (digitally). The thumb does most of the heavy lifting, with two thumb buttons and the modifier button and the aforementioned analog paddle. It’s a beast of a mouse, and yet surprisingly comfortable—as long as you have moderately large hands and use the “correct” grip. As far as I can tell, the Tyon caters to a three-finger palm grip. In other words, your index, middle, and ring fingers are all located on top of the mouse. You can get away with other grips, with varying results. Keeping only two fingers on top of the mouse (with middle finger controlling both Right Click and the scroll wheel) means your ring finger is in the way of two buttons and your pinky is squeezed for space. Claw grip means you lose access to the paddle behind the scroll wheel, though it’s easier to hit the two extra buttons on the index/ring finger. The main question is, as always, whether you actually need this many buttons. Unless you’re playing an MMO or something like Arma III, it’s doubtful. The button-heavy mouse has fallen out of fashion in most circles for good reason—for most people, six or eight buttons is the sweet spot. Add more and you’re likely to forget to take advantage. And the Tyon makes some weird choices. That modifier (Easy-Shift) key, for instance. There’s a button on the thumb rest that is basically an Alt key for your mouse, giving you twice the mapping options. Great, in theory. But due to the button’s placement, it’s pretty much impossible to hold it down and use the other two thumb buttons at the same time. Plus, notice I said it’s located on the thumb rest? Roccat put the modifier button right where you’d typically lay your thumb, which led to a few inadvertent clicks on my part. I also wish the top (digital) paddle and scroll wheel were simply combined into a tilt wheel. The tilt wheel is one of my favorite (rare) mouse features, and even made its way to Razer’s 2014 Naga. The Tyon has all the components of a tilt wheel...split into two pieces. It seems unnecessary, and the placement of the paddle is awkward as hell at the moment. I like the Tyon better overall than the Naga, though. I’ve always had trouble telling the difference between the Naga’s twelve numpad-style thumb buttons. The Tyon gives you similar functionality but with more unique button positions. And really your appreciation for the Tyon will come down to how much time you’re willing to put into fiddling. This isn’t a plug-and-play sort of mouse. Or, at least, not if you want to tap into its full potential. You’re going to need to spend some time deciding how to map each button twice-over. Do so, and some ingenious control schemes open up though. Change weapons by flicking the analog paddle back and forth. Melee by hitting Left Mouse while the modifier key is held down. The Tyon has a ton of functionality, if you’ve got the patience and the creativity. I’m personally pretty happy with a more stripped-down mouse. I don’t play many games that would take advantage of the Tyon’s suite of buttons, and even when I do I’m typically prone to forgetting what mouse shortcuts I’ve set up. If you are in the market for a button-heavy mouse, the Tyon is probably my favorite though. It’s much more intuitive to me than the Naga-style numpad design, and I actually found myself missing Easy-Shift once I went back to a different mouse. The only real issue is the price. 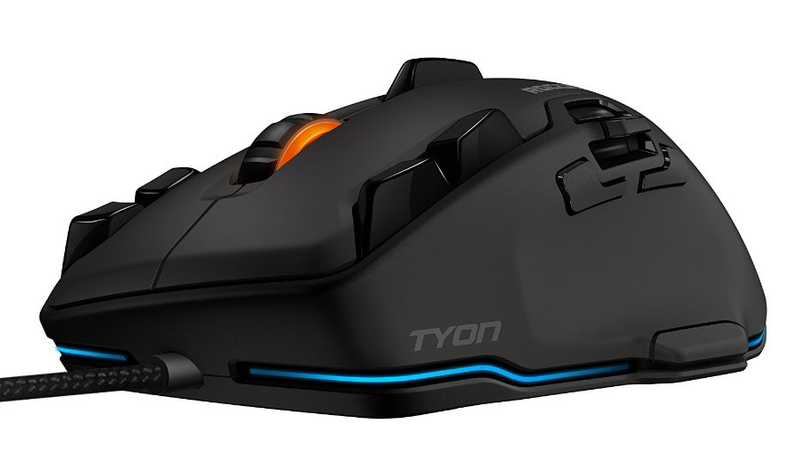 $100 is steep, for any mouse—even if you do the math and realize the Tyon’s cost breaks down to $7 per button.